Visual acuity. This, literally, is the sharpness of your vision. Visual acuity is measured by your ability to identify letters or numbers on a standardized eye chart from a specific viewing distance. It’s tested one eye at a time, with the help of a standardized Snellen eye chart. 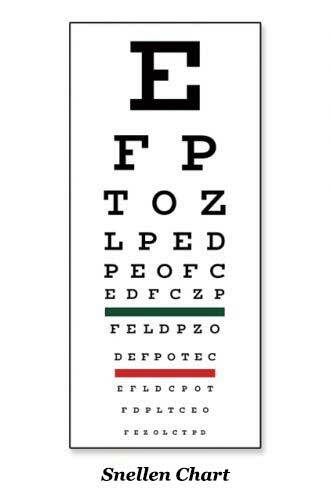 Visual acuity is a static measurement, meaning you are sitting still during the testing and the letters or numbers you are viewing also are stationary. Only light that is focused on a very small and highly sensitive portion of the central retina influences va measurements obtained during an eye exam.